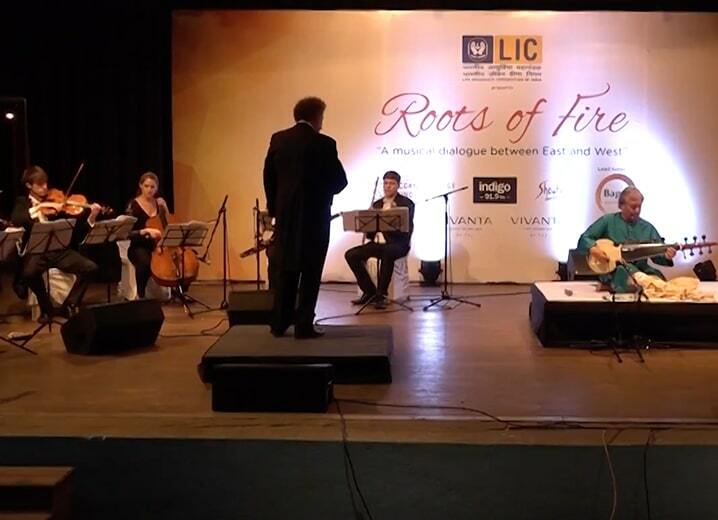 In January 2017, Goa and Mumbai saw the fruition of a pioneering international musical project, Roots of Fire, which aims to celebrate the on-going musical dialogue between the East and the West and inspire young, aspiring instrumentalists. This video showcases highlights of the project in Goa and Mumbai. Roots of Fire, produced by the chamber orchestra Sinfonia Verdi and supported by the Bagri Foundation and Deccan Heritage Foundation, offers a unique opportunity to create music works and education resources that offer new audiences in the UK and India, the opportunity to engage with both Indian and Western music. During the trip to Goa, Goan children were given the opportunity to experience instruments and mix rhythmic western harmony with Indian rhythmic ideas through masterclasses conducted by internationally acclaimed conductor David Murphy and Sarod sensations, Amaan Ali Bangash and Ayaan Ali Bangash, held at the Lourdes Convent in Saligao between the 16 and 19 January. Their journey culminated in a concert combining Eastern and Western traditions on 19 January with the legendary Sarod maestro Ustad Amjad Ali Khan and the UK-based Orchestra Sinfonia Verdi conducted by David Murphy. The performance included works by Mozart, Ustad Amjad Ali Khan and David Murphy. The project then moved to Mumbai for a performance at the Royal Opera House on 20th January with Amaan Ali Bangash and Ayaan Ali Bangash and David Murphy.